This week, we welcome two new and exciting advertisers to our fantastic family of partners. Libby Lyman has been expanding her knowledge base, circle of comfort, and client list with a Gentle Approach to Horsemanship. She leads clinics from California to Maine and points in between. 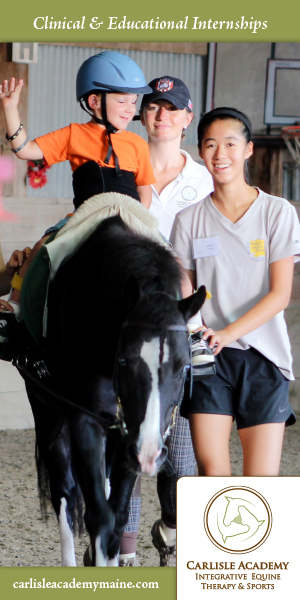 This summer, she has several clinics at Piper Ridge Farm in Limerick, Maine. Visit her site and check out the Events page for her new listings. 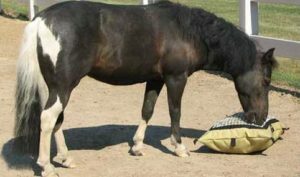 Hay Pillow is a fabulous, slow-feeding product developed by Monique Warren, a horse enthusiast extraordinaire, who observes that slow-feeders make for healthier, happier horses. Her products are Made in America, come in a helpful variety of sizes, and on line ordering is simple and descriptions well-explained. Stay tuned for more reporting on Lyman and Hay Pillow! And tell ‘em you found them on NickerNews and BestHorsePractices. Posted in BestHorsePractices, Events, Reviews and Links and tagged hay pillow, libby lyman. ← Nicker More, Buck Less Bottles are here!